The huge asteroid tumbled majestically through the void, dwarfing his asteroid brethren close by, some of which themselves measured hundreds of meters in diameter. Gabri Cichan had been working his way towards the behemoth for the better part of an hour now. He had even given the huge asteroid a girl’s name, as was his want with asteroids he hoped would make his dreams come true and fill his pockets with cash - this one he called Theriese. His cargo hold was half-full of minerals by now, Cichan hoped to fill it completely by mining Theriese, preferably with some rarities. Approaching it was not easy - lesser asteroids seemed to swarm around it in great clusters, making it tricky to navigate through the maze of rock. Cichan kept his mining drones occupied on nearby asteroids while maneuvering closer to the big one. As soon as he was in range he sent some of them up ahead to start digging into Theriese. Getting closer Cichan noticed other drones mingling with his own. Thinking another miner was in the vicinity he started scanning his radar, but detected no ships - just those few extra drones and the asteroids rolling around his ship. Continuing his approach unabated Cichan squeezed between a couple of asteroids that formed a sort of a gateway to his objective. Finally entering the empty space around Theriese, Cichan was quickly unnerved by the sight that greeted him in the asylum beneath Theriese’s shadow. Clinging to the inner sides of the two gateway asteroids were sprawling rogue drone lairs - hundred of meters of dark metallic and menacing abode buried deep into the rock and housing hundreds of wild drones. Cichan had heard of these monstrosities, but never one so big as the one he was viewing now. The lair was not only cleverly hidden in every direction from prying eyes - it was also superbly located close to the mammoth asteroid that was sure to attract miners from miles away. As a prove to that point Cichan noticed the remains of several ships perched by the drone lairs, being systematically taken apart by worker drones and incorporated into the ever-expanding drone complex. Fast approaching combat drones made Cichan fear his ship would share the same fate all-to-soon. In a desperate attempt to escape the attacking drones Cichan slammed his ship into evasive maneuvers while trying to kick-start the warp drive at the same time. His only chance was to outmaneuver the drones long enough until his warp drive would activate. The bulky combat drones were sluggish in their pursuit of the fleeing vessel, but more nimble assault drones surged ahead and quickly caught up. The assault drones were equipped with energy leech equipment and once in range they set out to disrupt the energy flow in Cichan’s ship. The ship’s power core could have coped with two or three of these little buggers, but the ship was soon swamped by them and the power supply drained rapidly. By the time the warp drive was online it was too late - Cichan no longer had the energy available to activate it. Then the combat drones arrived. When Cichan was some minutes later being whisked away in his capsule he thought himself lucky to escape alive. His ship and everything in it was lost - it was now serving as fodder for the growing drone lairs of Theriese. Well, he thought, at least he had an interesting story to tell his friends. Rogue drones and wild drones are the terms used over advanced drones that mutated out of control. A few years ago some ingenious Gallentean inventor had the idea of creating super-advanced drones that could think and act on their own - in essence acting in every sense like a regular space ship except being unmanned and computer controlled. First prototypes were encouraging, but then disaster struck. The drones became unruly, then unmanageable. Some of these were huge - the largest drones ever constructed, these drones were even equipped with warp drives and equipped with the latest advancements in artificial intelligence. These mother drones, as they were called, along with several lesser drones soon managed to spread out, not only within the same system as the research facility that birthed them, but also to other systems. Only later men discovered exactly how - the drones attacked and took over space ships, then used them to jump to other systems, the drones themselves safely hidden within the ship. Needless to say the super-drone research was soon abandoned by the Gallenteans. The rogue drones soon started behaving very much like other living beings. They constructed a home for themselves, usually deep in some remote asteroid field, and began plans for reproduction. This involved both the mining of asteroids and attacks on unsuspecting mining vessels - all with the intent of gathering the materials needed to expand their homes and to build their own drones. 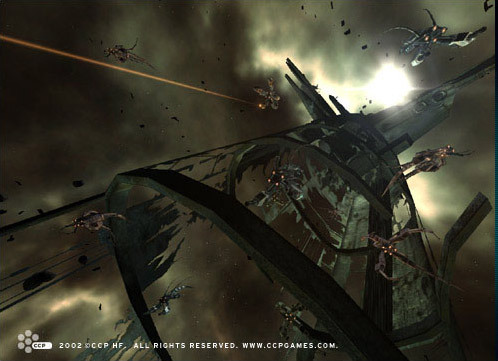 As the months passed drone lairs popped up in dozen different places and today they can be found in almost every corner of the world, harassing and killing space farers of every sort. As each drone lair is started by a separate mother drone they often evolve in quite different ways. Each new generation of rogue drones shows some new mutations, creating a huge diversity in the shape, size and power for rogue drones. In areas where rogue drones are numerous and seen as deterrents to normal mining and trade operations, the local authorities have taken it upon themselves to employ armed forces to destroy rogue drone lairs, or at least keep them from spreading too heavily. Discussions have been held between the empires and within CONCORD about a possible joint effort to rid the world of rogue drones, but these discussions have not let to any concrete deals being made. Thus, it is still up to the local authorities of any given place to deal with the drones as best they can.